Mexican President Vicente Fox has voiced concern over US plans to use the National Guard to patrol the border. 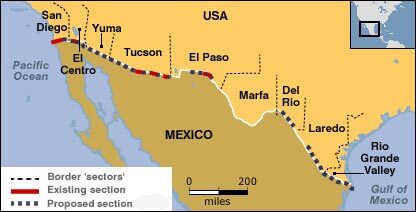 But, in a 30-minute phone conversation, President George W Bush is said to have assured him that the move did not mean a militarisation of the border. Mr Bush is due to announce the plans in a speech on Monday as part of an effort to help curb illegal immigration. 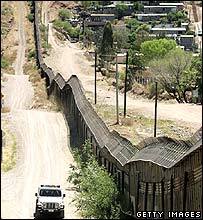 The Bush administration has insisted that Mexico is still regarded as a friendly country. According to a statement released by Mr Fox's office, Mr Bush had said officials were "analysing the administrative and logistical support of part of the National Guard, not the Army, to help police on the border". The immigration issue has sparked fierce debate in the US. Mr Bush's speech on Monday evening will discuss how the US should deal with border security and what should happen to the millions of illegal immigrants already in the country. The BBC's Justin Webb in Washington says Mr Bush hopes that being tough on future illegal immigration could help to get backing from Republicans to provide an amnesty to those already on US soil. Congress is currently considering plans to reform immigration laws. A bill passed last year by the House of Representatives includes provisions to make illegal immigration a felony and to bolster border security. However a Senate bill, currently stalled, would allow illegal immigrants to apply for citizenship and set up a guest worker programme, which is favoured by Mr Bush.